For this year's APO Chamber Music concert, my quartet will be tackling the first movement of the Mozart Quartet for Flute and Strings in D Major K.285. It's a lovely piece with great material for all four of the players. Our group will be made up of Carolyn Anderson on Flute, Catherine Castro on Violin, me on Viola and Richard Strauss on Cello. Carolyn played the Mozart Concerto for Flute and Harp together with Anne Eisfeller of the NMSO during our last season, and it was just terrific! So we're excited about playing some chamber music with her. The concert starts at 2:00 PM on Sunday, May 18th, and will be held at St. Michael and All Angels Episcopal Church, 601 Montano NW. It's free, so come by for an afternoon of good music with a bunch of different chamber music groups from the APO. 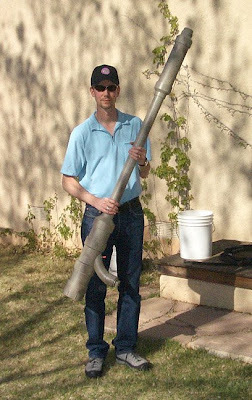 A few weeks ago after watching some videos on YouTube, I decided to jump in and make my own potato cannon (often called a spud gun). Basically, these things are low-tech muzzle-loading guns made from PVC or ABS plastic pipe. My first one had a 1-1/2" bore, 4 ft. barrel, and a 3" chamber that was 18" long. I've learned that the "ideal" ratio of chamber to barrel volume is 1.5:1 to maximize muzzle velocity for the projectile (potato). I've also learned that one of the more common fuels, hair spray, is far from ideal. For one thing, it takes more of it to get the appropriate "bang". Also, it smells awful after burning and leaves a sticky residue that can gunk up your gun over time. A aerosol product that I remembered as being very flammable proved to be much superior to hair spray: Static Guard. The smell after ignition is not great, but it beats hair spray. Others have reported that Axe deodorant also works well. I'm interested to try white gas (pure gasoline used for camping stoves) sprayed from a mister. One common mistake I see a lot on forums, YouTube and elsewhere is the use of too much fuel. It really takes very little, and you need a lot of air for the fuel to properly burn. I spray Static Guard for about a half second - that's all it takes even for a large gun like my second one.